In honor and respect; the Miami Police Department Chief of Police, his Staff, and all its members dedicate our remembrance badge, challenge coins, and lapel pin to those who have made the ultimate sacrifice and lost their life on duty. As a consoling reminder, the Thin Blue Line is embraced in a custom designed and handcrafted badge, challenge coins, and lapel pin. Our remembrance set is not only a visible reminder and memorial to fallen officers, but it’s a support for their families as well. With great respect and honor, we salute our fallen. All orders placed before February 15, 2019, will be delivered by April 26, 2019. View all remembrance items for your support today. Each Miami Police Department Memorial Badge is custom created to order. The badges are die struck from solid brass, and finished in either rhodium or 24 karat gold electroplate finish. Every badge is outfitted with a heavy duty pin & safety catch for uniform wear, carefully enameled, hand polished to a brilliant luster and finished to the highest quality standards. Each badge is expertly packaged in a black velour presentation box. 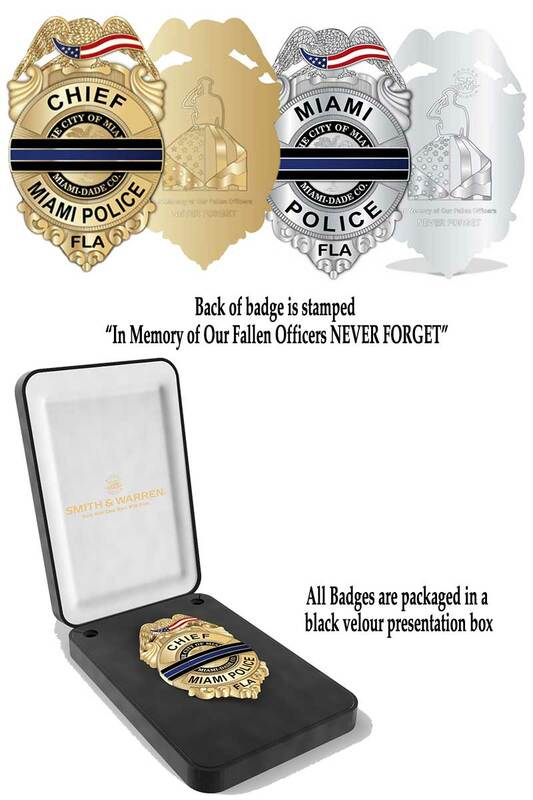 Every Miami Police Department Memorial Badge is also covered by a Full Lifetime Warranty. 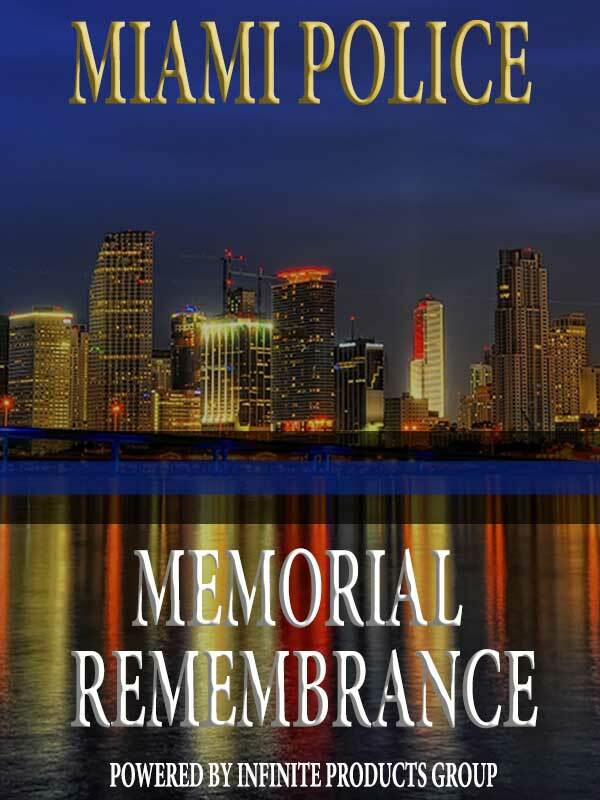 Miami Police Memorial Badge can only be purchased by active duty sworn and retired personnel. 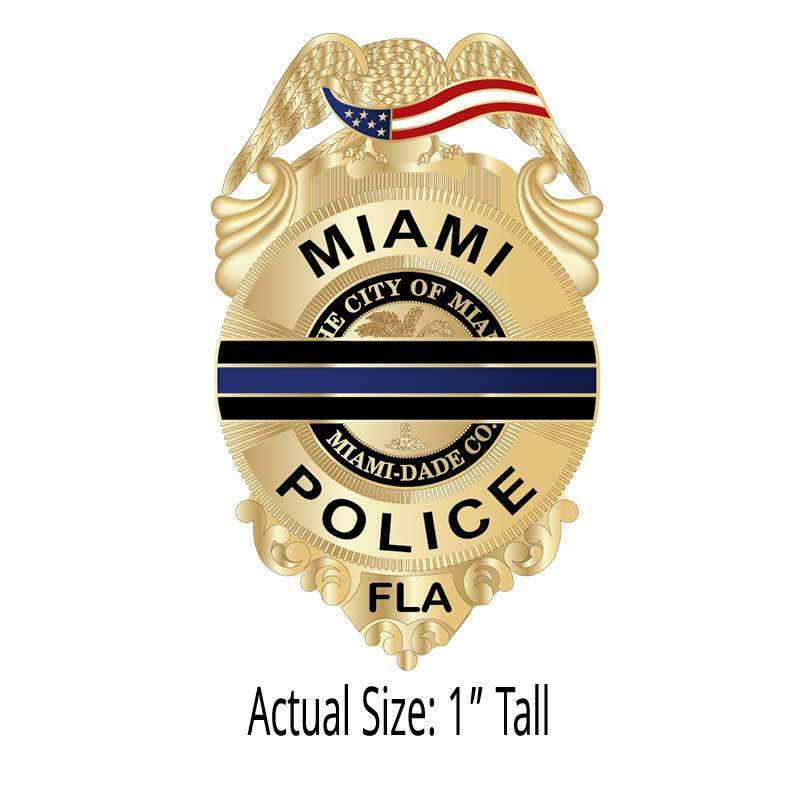 Name and badge details will be sent to a point of contact at Miami Police for verification prior to production. For every badge sold, $5.00 will be donated to the Police Officer Assistance Trust (POAT) - "Dedicated to the law enforcement community of Miami-Dade County by providing assistance to the officers and their families in the times of hardship and personal crisis". 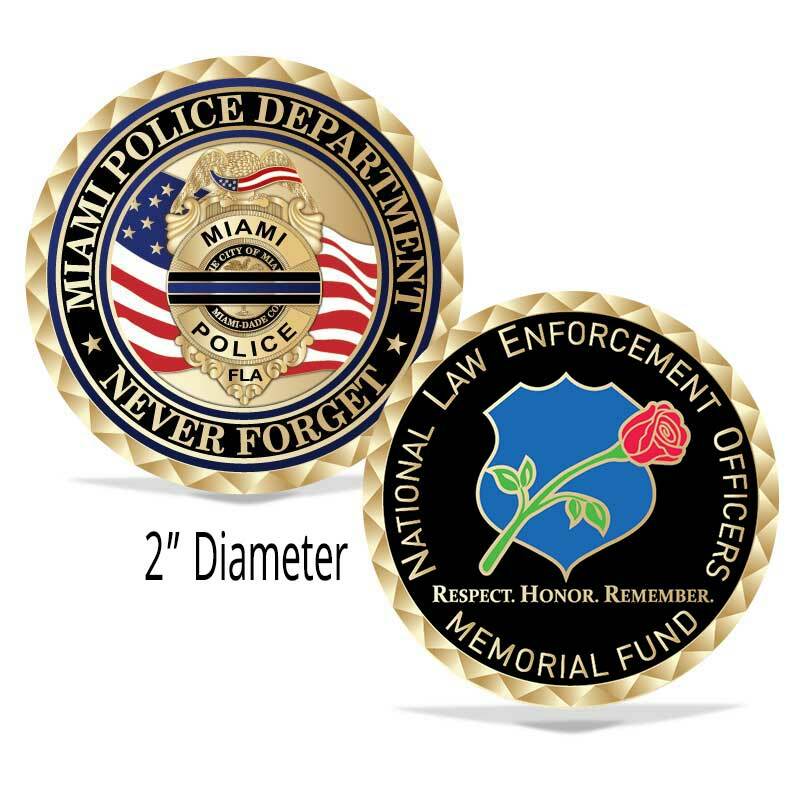 The Miami Police Department, National Law Enforcement Officers Memorial Fund 2" diameter Coin is custom designed with the Miami Police Department Name and 3D sculpted Memorial badge with an enameled American Flag Backdrop as well as a reminder that we will NEVER FORGET the sacrifices of fallen officers on the front side. The back of the coin is features the National Law Enforcement Officers Memorial Fund logo. For every coin sold, $5.00 will be donated to the National Law Enforcement Officers Memorial Fund (NLEOMF) - "Dedicated to telling the story of American Law Enforcement and making it safer for those who serve." 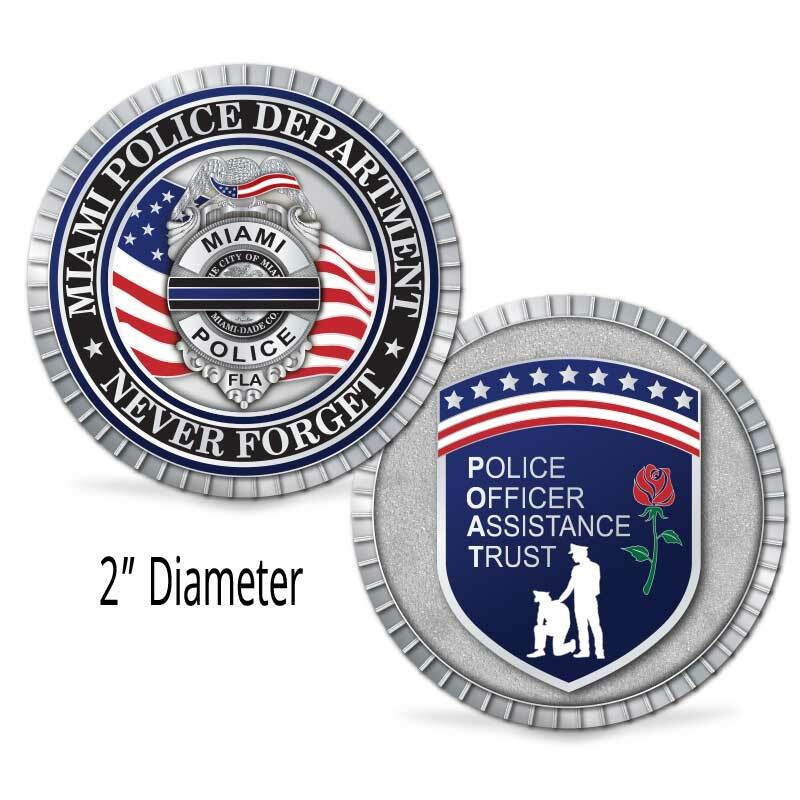 The Miami Police Department, Police Officer Assistance Trust Coin is a custom designed 2" diameter coin with the Miami Police Department Name and 3D sculpted Memorial badge with an enameled American Flag Backdrop as well as a reminder that we will NEVER FORGET the sacrifices of fallen officers on the front side. The back of the coin features the Police Officer Assistance Trust (POAT) logo. For every coin sold, $5.00 will be donated to thePolice Officer Assistance Trust (POAT) - "Dedicated to the law enforcement community of Miami-Dade County by providing assistance to the officers and their families in the times of hardship and personal crisis". The Miami Police Department Memorial Lapel Pin is the perfect way to show your support in your civilian attire. Each 1" tall gold pin is carefully polished, electroplated and fitted with a clutch back attachment.